I guess this is where it all began. 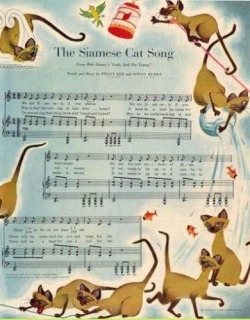 My earliest recollection of my obsession with the Siamese breed began with a couple Walt Disney movies...remember Si and Am from Lady and the Tramp? 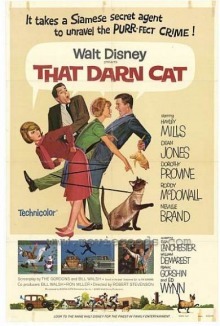 Or that Darn Cat? I think evil is too strong a word, I like to call them resourceful! 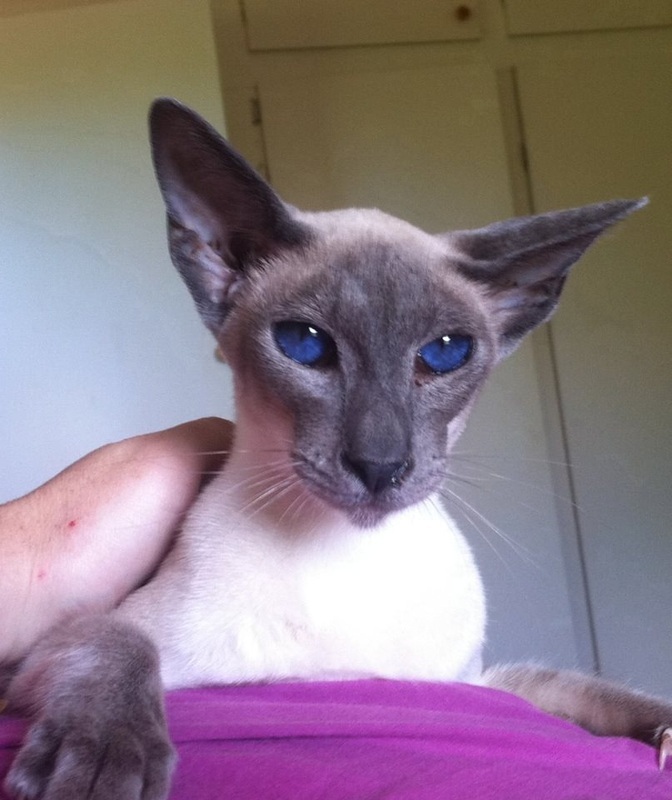 Below please find some useful information for those considering being owned by a Siamese, Oriental or Peterbald and please do not hesitate to contact us with any questions at all about the breeds. Siamese are affectionate and intelligent companions, renowned for their social nature and are sometimes described as "extroverts". As there are extrovert Siamese, there also are some that have very sensitive and nervous temperaments. Those individuals may not easily adapt to the changes of environment or to strangers. They do have a great need for human companionship. Often they bond strongly to a single person. 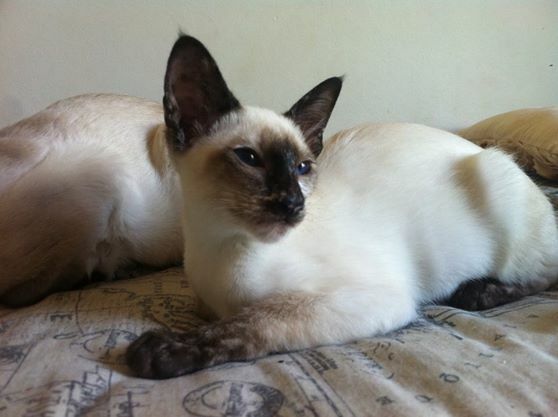 Most Siamese like to have other sociable cats for company and do not thrive as only cats owned by people who are gone much of the day. These cats are typically active and playful, even as adults and will enjoy to play a game of fetch. 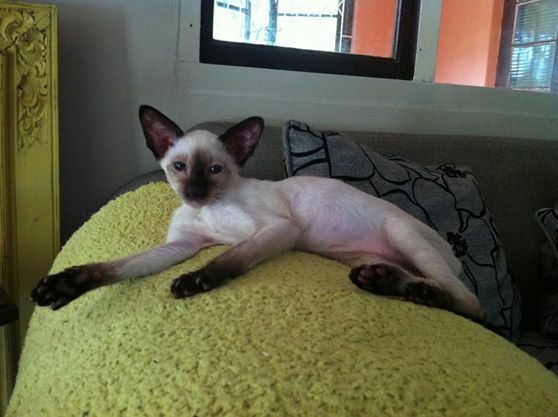 To a Siamese, trousers and curtains alike make great scratch posts and they can scale both in the blink of an eye! In Thailand, where they originate from, they are called Wichien-maat (a name meaning "Moon diamond") and were regarded as royalty (some say they have never forgotten this!). In early Siamese, cross-eyes and kinked tails were common, although this has been mostly eradicated by modern breeding efforts. The story behind this trait is that Siamese palace and temple cats helped guard precious treasure. So diligent were they that their eyes became crossed from staring at the objects they were guarding. Their kinked tails came about when a Princess put her rings on a cat's tail while she bathed. The cat knotted its tail round the rings for extra security hence the kinked tails of early Siamese cats. In the twentieth century the Siamese cat became one of the most instantly recognisable and popular breeds in Europe and North America. In the 1950s - 1960s, as the Siamese was increasing in popularity, many breeders and cat show judges began to favor a more slender look and as a result of generations of selective breeding, created increasingly long, fine-boned, narrow-headed cats; eventually the modern show Siamese was bred to be extremely elongated, with thin, tubular bodies, long, slender legs, a very long, very thin tail that tapers gradually into a point and long, narrow, wedge-shaped heads topped by extremely large, wide-set ears. 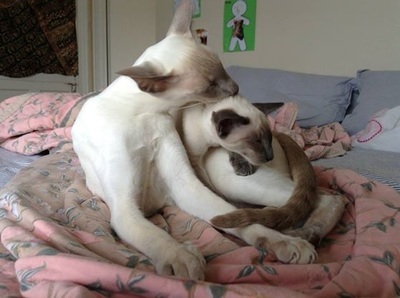 The major cat organisations altered language and/or interpretation of their official breed standards to favor this newer streamlined type of Siamese, and the minority of breeders who stayed with the original style found that their cats were no longer competitive in the show ring. The Siamese is characterized by its typical pointed color scheme. the basic colours are seal point, blue point, chocolate point, lilac point, red point and cream point. More recent additions include the colours cinnamon, fawn, caramel & apricot although their gene pool is still very small. From here the points can be solid, tortie or tabby pointed or if white is added, bi-colour. 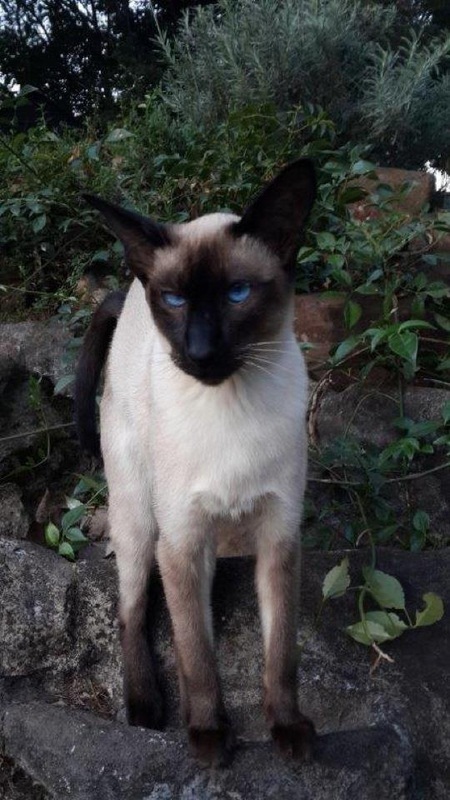 Whilst everybody knows the Siamese breed, I an often presented with the question "What is an Oriental" and the easiest way to describe it is a Siamese with colour all over its body, with mostly green eyes instead of blue. When the Oriental Shorthair was accepted for championship status in 1977 it rapidly became one of CFA’s most popular breeds. With over 300 different colors and patterns to choose from, you’re guaranteed to find an Oriental that will tickle your fancy. Imagine a Siamese wearing a head to toe coat in white, red, cream, black, blue, chocolate, lilac, cinnamon or fawn. These are the solids. For a sparkling undercoat, stir in the silver gene (to all but the white), and you have a smoke Oriental. Perhaps, instead, you'd like the color restricted to the tips of the hair. For this, we have the shadeds (ticked) to whet your appetite. Paint splashes of white on any of these coats and you have a bi-colour. With the 1995 addition of the Oriental Longhair (Javanese) into this family of sleek, muscular felines the Oriental breed can provide a cat for just about anyone. Oriental Shorthairs are very similar to their Siamese counterparts in nature. They are intelligent, social animals who bond very closely to their human. They are inquisitive, friendly, emotional, demanding and often quite vocal. They will depend on and trust you forever if you love and take care of them. Their purr can be extremely loud when happy. Conversely, they do not adapt to changes well and stress can weaken immunity and cause illness. Orientals also do not thrive as only pets if their human is not on hand for constant attention. Unsurpassed grace and elegance, sweet-natured and highly affectionate, the modern white Oriental is recognised with three different eye colours, BLUE, GREEN, and ODD-EYE (One Blue eye and one Green eye). A bit about the genetics that result in the white coat: the coat of a White Oriental works like "tippex" or an overcoat of white paint, masking the colour and pattern the Oriental would have been if not for the presence of the dominant white gene. 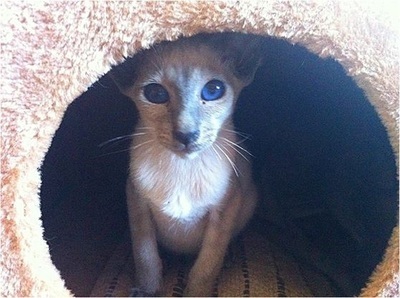 If you have a gentically Siamese cat, carrying the white gene, you get a blue-eyed White Oriental. Similarly, an Oriental carrying the white gene results in a green-eyed (or odd-eyed) White Oriental. If a White Oriental is masking red, tortie, calico or cream, the green eyes might be more yellow green or hazel in colour. The White Oriental is commonly known in the UK as the 'Foreign White'. 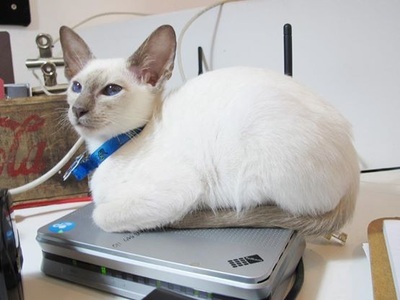 They originated in Britain in the 60s, when a Siamese was mated with a white domestic to produce a white cat with Oriental features and deep blue eyes. Today in many countries, including South Africa, the Foreign White falls under the Oriental umbrella and has become increasingly popular with breeders over the years. The White Oriental of today DOES NOT carry the blue-eyed gene that causes deafness. The Blue-eyed White gains its deep blue eye colour from the Siamese Semi Albino Gene and therefore deafness is not associated with the breed. 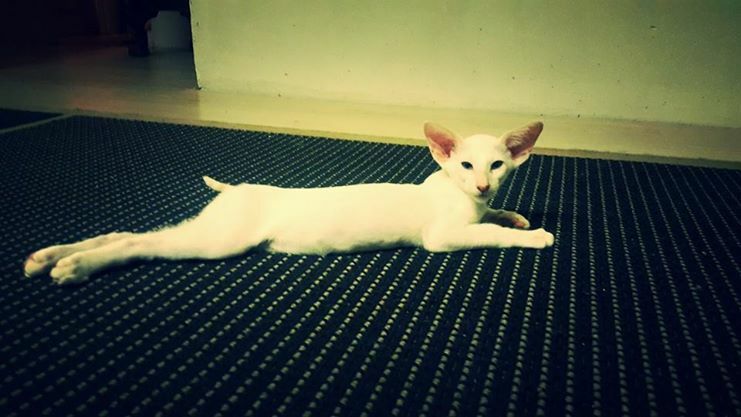 The White Oriental, like all white and hairless cats, is prone to sunburn if allowed to roam outdoors. Being feline, they love to seek out the heat and lounge in the sun for hours, however this can be detrimental to their sensitive skins, especially on their ears and noses. It is important that owners keep their White Orientals out of the sun, especially in South Africa's harsh summers! Apart from sun damage, the White Oriental has no other ties to any type of Cancers. Do not be discouraged by unfounded rumours. All in all, the White Oriental is as affectionate, playful and demanding as any other Oriental. They make wonderful pets and require no less grooming or attention than any other Oriental or Siamese. 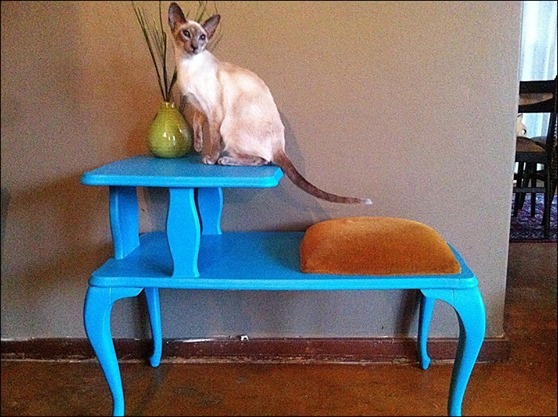 The epitome of elegance, the Porcelain Cat is a must have for any Oriental / Siamese lover!